The Starfish S.E.E.D.S. stands for Starfish Project for Children Supporting Entrepeneurial Endeavors & Designs for Service. 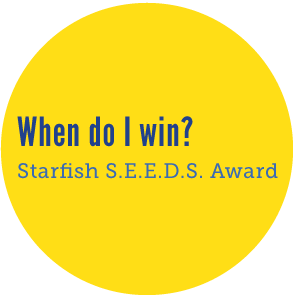 The Starfish SEEDS Award is awarded to a student who has an idea for community service that requires seed money. The idea must be an original idea for community service or an idea for an original way of engaging with an existing community service program. 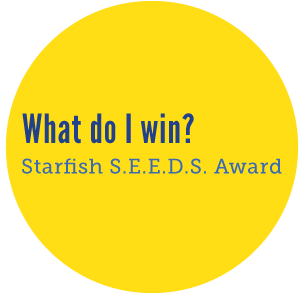 The Starfish SEEDS Award is awarded to up to two middle school students each year. 1. A one time gift of seed money up to $500 to fund the winning concept. 2. Pairing with an adult professional in the community who will work with the winner to a) create a business plan; b) create a schedule for launch and completion of the project; and c) design appropriate success measures for implementing the winning concept. 3. Where possible, the Starfish Project will connect the winner with an agency in the greater community which serves the needs targeted by the winner’s concept. 4. Community recognition through local media. 5. Induction into the Starfish Project for Children Honor Roll and an invitation to an exclusive reception at which SPFC Honor Roll candidates are inducted. Winners will be notified in May of each year. a. You will need to nominate yourself and you will need one person to serve as your reference. A reference that you are enrolled in school in Lower Merion Township and are capable of completing the project you wish to undertake. A reference has the option of submitting a paragraph in favor of your nomination. b. You will need your parent or guardian to acknowledge your nomination for this award. 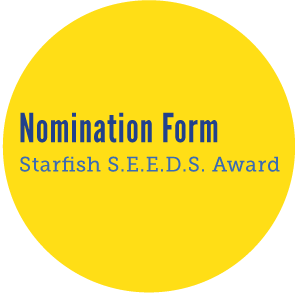 If you advance to final consideration, the Starfish Project for Children will call the parent of guardian who acknowledged your nomination to make sure you will be permitted to pursue your great idea should you win. If you are under age 13, click here to fill out a Nomination form. If you are 13 or older, click here to fill out a Nomination form.